A couple of weeks ago we held Maggie's fourth birthday party at our neighbourhood Loblaws. 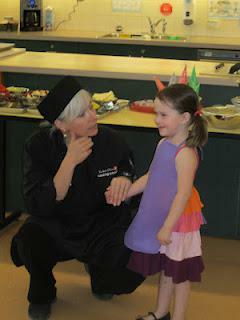 It was a PC Cooking School Birthday Party, and the kids had an absolute blast! One of our nieces in Aurora did her birthday this way last year, and I knew I wanted to copy it for one of our girls. Because our kids' parties usually involve their godparents, and Maggie's have five daughters from ages 7 to 11 between the two of them, I try to tailor the parties to suit the older kids as much as the guest of honor. This idea was perfect for all of them (including the four boy guests as well). I made the booking through the website, then went into the store to make a deposit and meet with "Chef Cat". She answered all of my questions, and even asked Maggie to make several important decisions about the menu for the day. I sent out the provided invitations, and left the rest of the planning and prep to the PC team! I bought a set of 12 children's aprons for $12 from e-bay (a few vendors have them; I found one with free shipping). Aprons are available for use at the party, but I thought this made a cute loot-bag replacement. 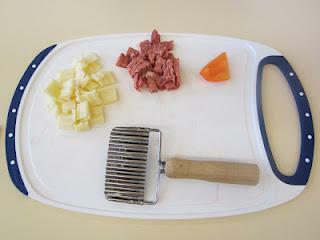 Next, they prepared pizza toppings with their own little chopper. Pizzas were then put in the oven to cook. (You'll want to do this party around a mealtime.) Kids were encouraged to try toppings they might not usually eat, but there was no pressure. 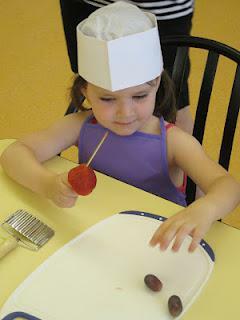 While the pizzas were cooking, each child received their own round cake to ice and decorate. Even the candy toppings were included, as well as an official bakery box to transport the creation home. This was the "party favour" (replacing the idea of a loot bag...although I couldn't resist picking up those aprons too). Next up? Enjoying the meal they had prepared themselves. 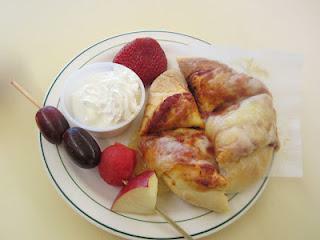 This is Maggie's plate...with some yogurt and a dollop of whipped cream on the side for fruit-dipping! 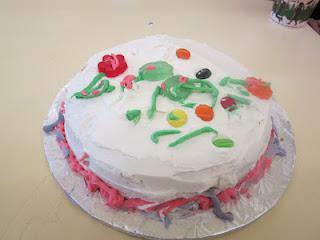 Even the birthday cake was provided, made to Maggie's specifications. 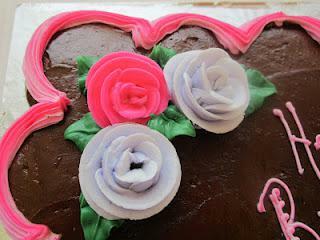 She chose a pull-apart cupcake cake with chocolate icing and pink and purple flowers! (If you're wondering about this photo, my husband was egging my sister-in-law and me on in a who-has the better-macro-feature competition. It works for this purpose, as I don't want to show the whole cake with Maggie's real name on it!) After the cake, time was provided for gift-opening (with the bonus being that you can leave all of the garbage behind!) and Cat was terrific about arranging a photo op and making the birthday girl feel very special. From start to finish the party was two hours, but it is a jam-packed time period, so encourage your guests to be punctual! As for the price...no prices are given on the website, which may mean that they vary by region, but we paid just over $200 for the minimum of 12 guests (extra for each additional guest). It was well worth it, considering that our alternative would have been to throw the party at home as usual, providing a meal, an activity/craft of some sort, decorations and loot bags. (Not to mention the time it takes to plan and shop for all of that.) Plus, not having to clean my house before and after? Priceless. I would highly, highly recommend this to anyone looking for that sort of venue party idea. While I likely wouldn't repeat it again with the same crowd, I could definitely see doing it for one of Frannie's future birthdays with her girlfriends from school. Please let me know if you have any questions, or check out the PC Cooking School website for more information. Disclosure: As hard as I tried, there were no deals for bloggers on this one! I'm promoting the party simply because I enjoyed it!